In 1928, Dr. Jan Zabinski (Johan Heldenbergh) became the director of the Warsaw Zoo. Over the next decade, he ran it with the help of his wife, Antonina (Jessica Chastain), who was something of a wildlife whisperer. The institution flourished under their auspices until the outbreak of the Second World War in September of '39 when Hitler invaded Poland. The zoo was closed to the public after being repeatedly bombed by the Luftwaffe during the siege of the city. However, the Zabinskis continued to live on the grounds with their young son (Timothy Radford) and the beleaguered animals that survived the attacks. But once Warsaw was occupied by the Nazis, the couple was ordered to report directly to Lutz Heck (Daniel Bruhl), the Third Reich's recently-appointed chief zoologist. Despite being married, Heck never bothered to hide his lust for attractive Antonina, shamelessly forcing himself on her as they attended to the agglomeration of exotic beasts scattered around the premises. Knowing that resistance was futile and might cost her her life, Jan directed his wife to submit to the unwelcome advances. And he understandably ended up feeling utterly emasculated by the frustration of failing to prevent her being pawed by the creepy Hitler henchman. Nevertheless, the Zabinskis did find an avenue of retaliation: the Polish resistance movement. Joining the Underground, they secretly helped smuggle Jews destined for the concentration camps out of the Warsaw ghetto. Furthermore, they hid the escapees on the grounds of the zoo at a time when death was the punishment for attempting to liberate a Jew. 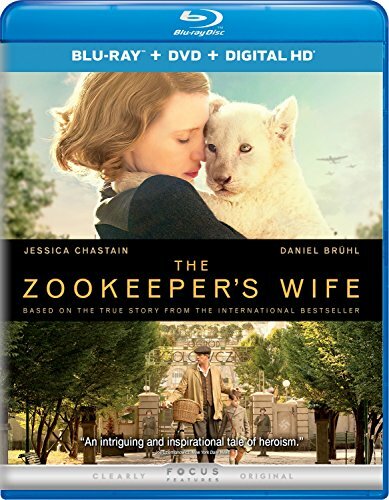 This is the spine-tingling series of events chronicled by The Zookeeper's Wife, a fact-based docudrama adapted from Diane Ackerman's best seller of the same name. Ackerman's book, FYI, had, in turn, been based on an unpublished memoir by Antonina Zabinski herself. Directed by Niki Caro (Whale Rider), the picture stars Jessica Chastain as the fearless and endearing title character. The two-time, Academy Award-nominee (for The Help and Zero Dark Thirty) delivers another quality performance, which is no surprise given how Caro has previously coaxed Oscar-nominated work out of a trio of talented actresses (Charlize Theron, Frances McDormand and Keisha Castle-Hughes). A bittersweet biopic belatedly paying tribute to an unsung heroine who selflessly put her life on the line in the face of unspeakable evil. Blu-ray/DVD Combo Pack Extras: The Zabinski Family; The Making of The Zookeeper's Wife, and deleted scenes..